As the title suggests it, the site is based on the famous English character Robin hood. The design is neat, fun, bright and inviting with a clear and easy-to-use navigation allowing visitors to find their way around the website quickly and efficiently. 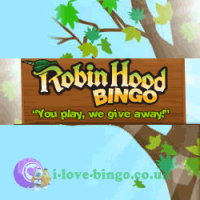 Robinhood bingo boosts with promotions and offers including big Jackpots, 1penny for £250 jackpots, Daily grand, BOGOF Robin's parties, Robin's Coins reward, refer a friend scheme, free bingo games for real prizes, million pounds draw twice per week and many more on going and adhoc offers. There are 4 bingo game variants on offer, comprising of 90Ball, 75Ball, Speed Ball and Swedish Bingo. Players can find a range of multiple bingo rooms within each bingo variant. Price tickets start for as little as 1 penny and there are daily offers and freebies to grab on the site, in the chat or in the lobby. As part of Dragonfish/ Cassava NetworkRobinhood Bingo boost an impressive range of games with 167 slots, 27 Scratch cards and Instant games (including Keno), 30 Branded games (monopoly, deal or no deal etc. ), and 17 classic casino games. Robinhood Bingo can be played on desktop computers and laptop as well as on most smartphone’s and tablets (subject to downloading the app).